If you love to make your own furniture, prefer to obtain your wood for woodworking directly from the sawmill without the roundabout route to the DIY store, or simply have large volumes of material to work with, it is well worth thinking of buying a stationary planer. Working with a stationary planer bears no comparison to working with a hand-held tool. It makes child's play of surfacing and thicknessing, with just a few steps required to change over between the two modes. 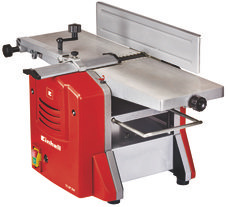 This means that the stationary planer is the perfect machine for the ambitious DIY carpenter.